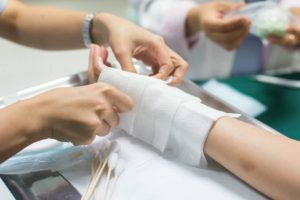 Serious burn injuries can be life threatening, and often leave victims with a lifetime of pain, stigmatizing scars and severe health problems. If you are the victim of third degree burns, or complications from second or first degree burns, you should contact a burn injury lawyer. The injury attorneys at the law firm of Aitken * Aitken * Cohn have extensive experience in burn injury cases. Our attorneys fight tirelessly for our clients and will do whatever it takes to get you the compensation you need. Burns can be fatal and cause extreme pain due to damaged nerve endings. Statistics for electrical burn injuries are especially grim, showing that 40 percent of all electrical burn injuries are fatal. These same statistics show electrical burn injuries, which can often occur in construction and other work sites, account for over 1,000 deaths per year and 3,000 admissions to hospital burn units. All types of burn injuries are classified by the degree of the burn, ranging from first degree burns to third degree burns. First degree burns involve the outer layer of skin, and may result in pain and sensitivity. Treatments can usually be self-administered, but there is always a risk of infection. Second degree burns involve more than one layer of skin, causes severe pain and swelling, with visible blistering. Third degree burns involve all layers of skin and the tissues beneath them. Third degree burns always require hospitalization and they put the victim at severe risk of infection. Pain will sometimes be less because nerves are totally destroyed, but there will be disfigurement from scarring. Treatments will often require skin grafting to repair damages. The Law Firm of Aitken * Aitken * Cohn has years of experience representing Riverside burn victims. If you or a loved one has suffered a devastating burn injury, contact our Riverside burn injury attorneys for a free consultation. We handle serious injury and wrongful death cases with compassion and dedication.